The Ohio River must host more baseball stadiums than any waterway in the country. Perhaps it just seems that way because I’ve seen several in the past year. 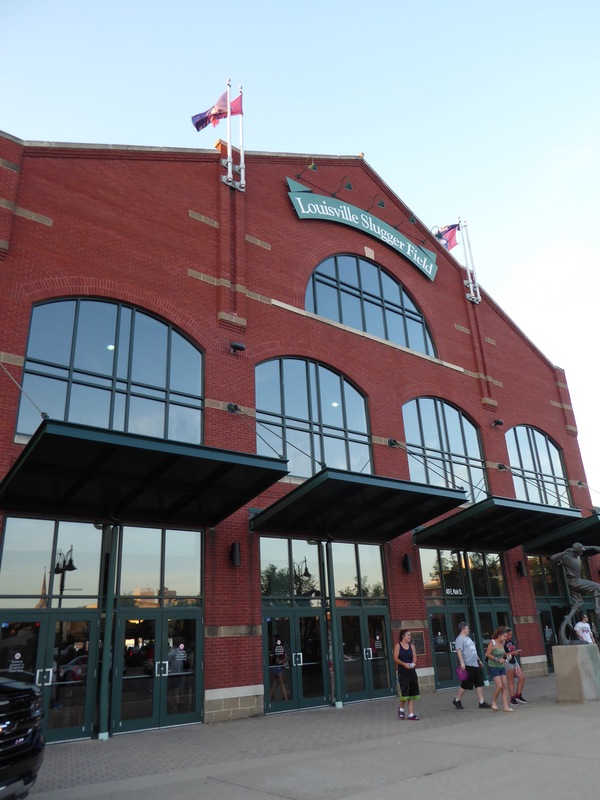 Louisville Slugger Stadium is a lovely “retro” style park with a seating capacity of 13,000 and plays home to the Louisville Bats, the AAA affiliate of the Cincinnati Reds, just up the river. The Bats were at home against another storied franchise, the Toledo Mud Hens of the Detroit Tigers organization. 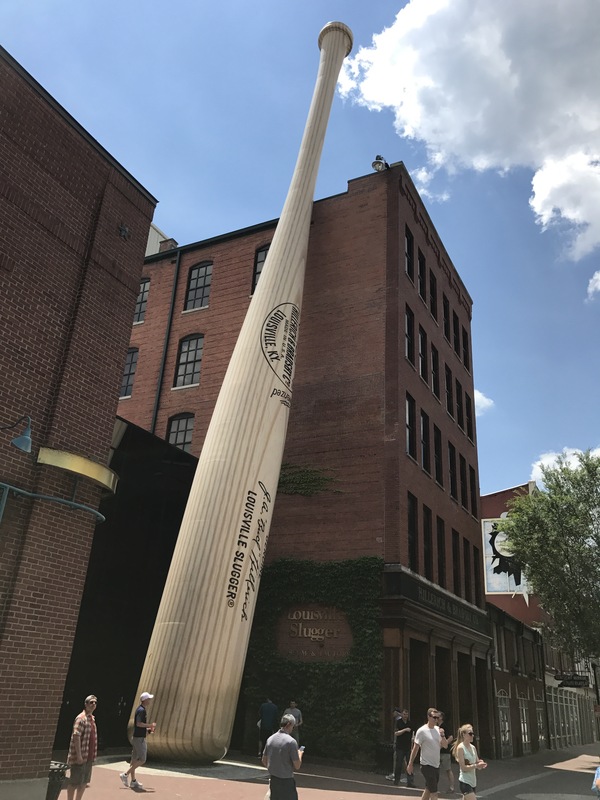 But before I got to the ballpark, I had to visit the Louisville Slugger Factory and Museum. It is this factory that gives Louisville its special place in baseball culture. For much of the history of the game, Hillerich & Bradsby, the company that manufactures the bats, was the dominant player in the field (yes, pun intended). They now face more competition, but still control about 60% of the market. The tour was interesting, showing how bats used to be made by hand (with a lathe, of course) and how they are now made by computerized machines that can turn out a customized bat for a major leaguer in 45 seconds. I felt stupid when I saw the Bats mascot because it hadn’t dawned on me that they would use the other common meaning for the word and have a flying bat as a mascot. 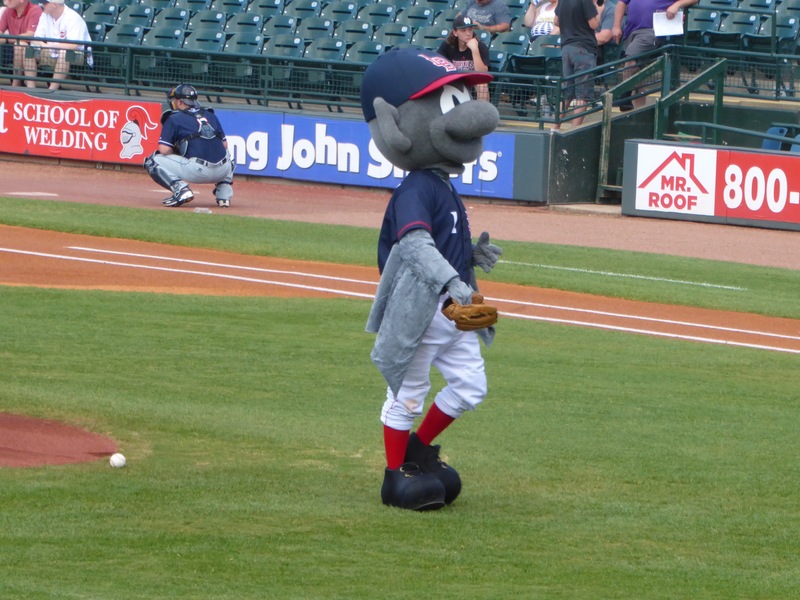 I should also note that this is the first mascot I’ve seen actually playing catch with a mitt and baseball. What’s with the ceremonial first pitch[es]? Last game and this one, they had about 5 first pitches. Hasn’t anyone pointed out that after the first one, there cannot be another first??? 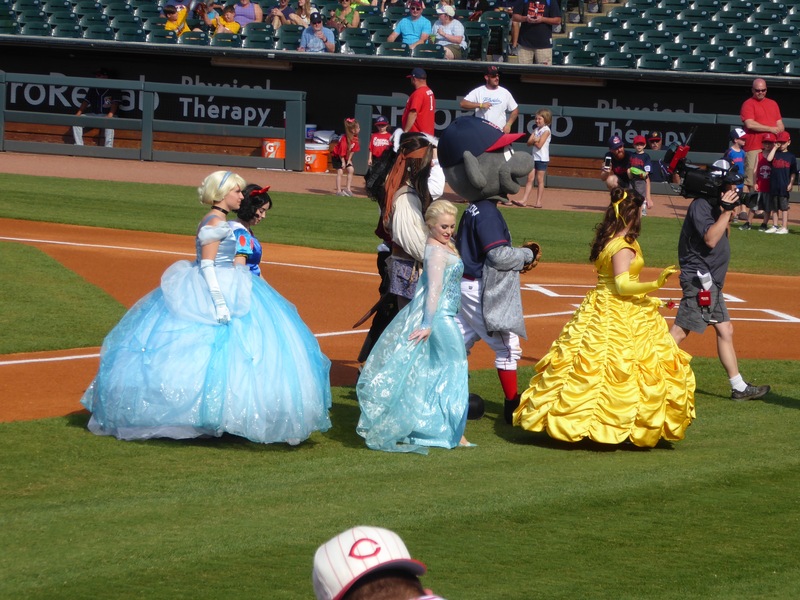 This being the south, they had to have young ladies in fancy dresses as a part of the ceremony. Once again, I got to see a former Mariner, Brendan Ryan, this one playing shortstop for the Mud Hens. He’s generally a good defensive player (though he made one error here), but he still can’t hit a lick. His average is below the Mendoza line – in AAA! Nevertheless, the Mud Hens batted around in the first inning, scoring five runs, and never looked back, winning easily 7-2. 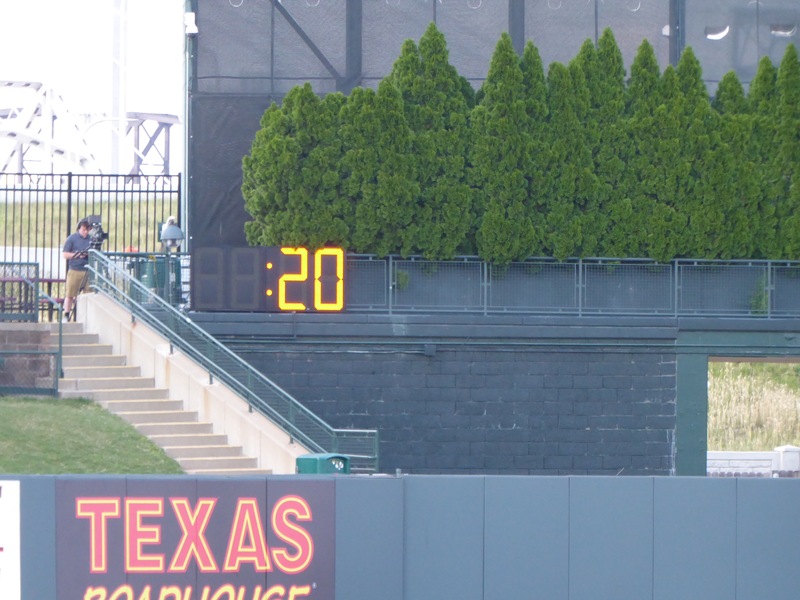 Once again, the 20 second clock was in evidence, which requires the pitcher to deliver the next pitch within 20 seconds of receiving the ball on the mound. It was never enforced by the umpires, but all the pitchers seemed to comply. The game lasted a mere 2.5 hours, so maybe the Bigs should consider it. Finally, eats. The prices here were very reasonable by ballpark standards. A regular dog costs $3.75 and there are several options under $6. There were the usual choices on burgers, pizza and the like, but quite a good variety of beer. I had my new favorite, Leinenkugel Summer Shandy with a Grand Slam Dog. I was going to be good but the devil appeared in pig’s clothing and made me eat that half pound wonder. Ahh, life-giving pig fat! Are you sure those aren’t Disney Princesses? Toledo, and before that Bowling Green, are near where I grew up, to the extent that doesn’t proceed from a false premise. Would it be inappropriate for me to point out to a 70 year old guy that the real American Birding Association name for a “Mud Hen” is “AMERICAN COOT”? Any whos, your reports from the road are spectacular, as always. I have one suggestion: a comparative hot dog chart. You are giving us a good description with each blogentry but we need a comparison, maybe even with a category for condiments, for the whole trip. just a thought. And I meant to mention that it looks like you’ve saved the Hartford Yard Goats for another year. Keep on Bobbin’. I don’t think my memory (or other skills, to the extent I have any) is adequate to do a chart, but I can say unequivocally that last night’s Grand Slam Dog is far and away the biggest, longest, heaviest and best I’ve had anywhere.